Bronco Texas and Old Pueblo Springs. Bronco never had a railroad, but has somehow managed to reach its centennial year - due to occur in 2003. A cowboy with the colorful name of "Gravy" Fields opened a store and applied for a post office in 1903. The name is said to have been suggested by a traveling salesman. Field's store supplied ranches in the vicinity and by 1912 the town had 25 persons. The population high-water mark wasn't reached until the 1960s when it was estimated to be 180. It has since declined to the present estimate of 30. Just two miles west of town was a watering hole predating Spanish exploration. Dear Editor of Texas Escapes, This morning, on a lark, I typed in Bronco, Texas on my internet search engine. 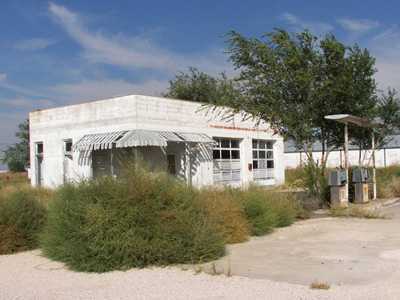 The first image that popped up on your website was a photograph of an old gas station. That gas station was owned by my Grandparents and I spent every summer from 1965 to 1980 there. I grew up in the Dallas area, but as soon as school was out for summer vacation, I would beg my parents to take me to the bustling metropolis of Bronco! As is with all small towns, Bronco had a ton of stories. Gravy (the town's founding father) had three children...Robert, Ty and Anita. They all built their homes around their father's house and they lived there their whole lives. Robert had the 07 Ranch and was quite successful, as was Ty. They were both larger than life west Texas Ranchmen. At the gas station where I would spend all day with my granddad, we would have the most colorful characters pass through. One day, we had a woman who was roller skating from California to Florida! She was doing it to raise money for some organization and this was back in the day before that became popular to do to bring awareness to whatever cause the person is promoting. We had people who would show up without any money and they would trade whatever they owned for a tank full of gas. Many times my grandfather would just give them the gas...he wouldn't even charge them. But then again, if you knew my grandfather, you would know that's the type of man he was. At one time, there was a restaurant, cotton gin, mercantile store, and the gas station all operating at the same time. Bronco was hopping! 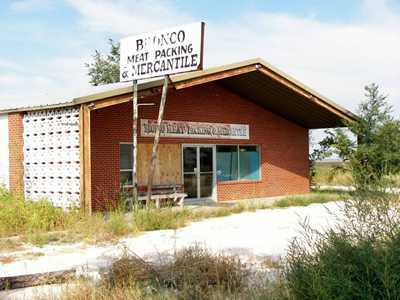 Just north of Bronco was a slaughtering house owned by Dan Fields (Ty's son.) But like most small towns, there always seems to be a catalyst which leads to it's demise and that catalyst was that the price of gas had gone through the roof. Plus with gas rations, people began traveling less to vacation spots like Ruidoso and where we once would easily pump a thousand gallons a day of gas, we began to pump less than a hundred. Oh there were some days better than others, but you could feel the winds of change. I've never been back to Bronco since 1980. My grandparents closed up the gas station and moved to central Texas. My grandfather has passed on, but my grandmother continues to live a full life. My wife went to High School in nearby Plains, Texas, and lived about twelve miles southeast of Bronco. She rode a school bus to Bronco where it first turned north on State Line road to let some kids off and then it went south to deliver her and others. There was a standing deal with the bus driver that if all went well on the bus; the southbound kids could get off at Fields Store while the north bound group was being taken home. Then the south bound group would get back on and continue on their way. Can you imagine such a thing being allowed in this day and age? We both graduated from High School in 1959. We met the first day of college, hit it off rather well and soon I found myself making little weekend trips with her to her home. Coming from the west, the civilized way to her house was into Plains, about ten miles southwest on the Lovington Hiway then west on a fairly decent county road to the house. However, at Bronco it was possible to turn south about eight miles, hope to spot the irrigation pump with the big PontiacV8 engine strapped to it and turn east a couple of miles. This road was not much more than turn-rows and not a good idea in bad weather but a lot quicker. It was a bit of an adventure during the winter, it do get cold on the High Plains. To understand Bronco a little better, you must know what was on the New Mexico side of the line in those days. Lea county N.M. was "wet" while Yoakum county TX was and I think still is "dry". There was a "watering hole' about 50 feet from state line road. There were not enough New Mexicans within 20 miles to fill the bar so they had to mostly be Texans. The time zone changes from Central to Mountain time at that point so I guess they figured it was all right to drink as long as it wasn't on Texas time. A few years later there was an accident at the intersection in which a car lost control, went through the bar and destroyed an airplane that had been parked inside the tin building that had once served as a dance hall. A car, two people, a bar, a dance hall and an airplane all at the same time! Sounds like divine intervention to me. We were married in Plains in 1961, and did not get back for many years. By then most things had changed in Bronco. On a trip west we turned south, then east and found what was left of the house. Just a pile of concrete blocks and a couple of rusted out pickup truck bodies. She poked around through the junk but unlike a movie, she found no childhood treasures, just junk. That was 2002 and we haven't been back since. Some years ago a Welsh Poet wrote "you can never go home" and guess he was right.